With his selection of the theme All the World’s Futures, Okwui Enwezor, head curator of the 56th Venice Biennale, invited tha artist to examine the possible ‘futures of the world’. In this context, artist Szilárd Cseke considered the foundational concept. The curatorial concept therefore envisioned an associative, a cognitive space in the Hungarian pavilion in which interpretation was realized on a personal, communal and global level. Szilárd Cseke’s installation entitled Sustainable Identities represented Hungary between 9 May and 22 November 2015 at the Biennale di Venezia. The installation investigated global issues. Questions of identity were brought into collision with themes of migration and personal decision-making, thus alluding to sustainability with the combination of found and recycled objects. 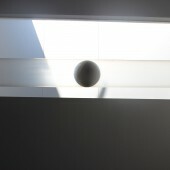 White balls continuously moving back and forth inside the seven translucent tubes called attention to collective and individual identity formations. The interactive elements of the inner courtyard called on the visitors to write, draw and move. 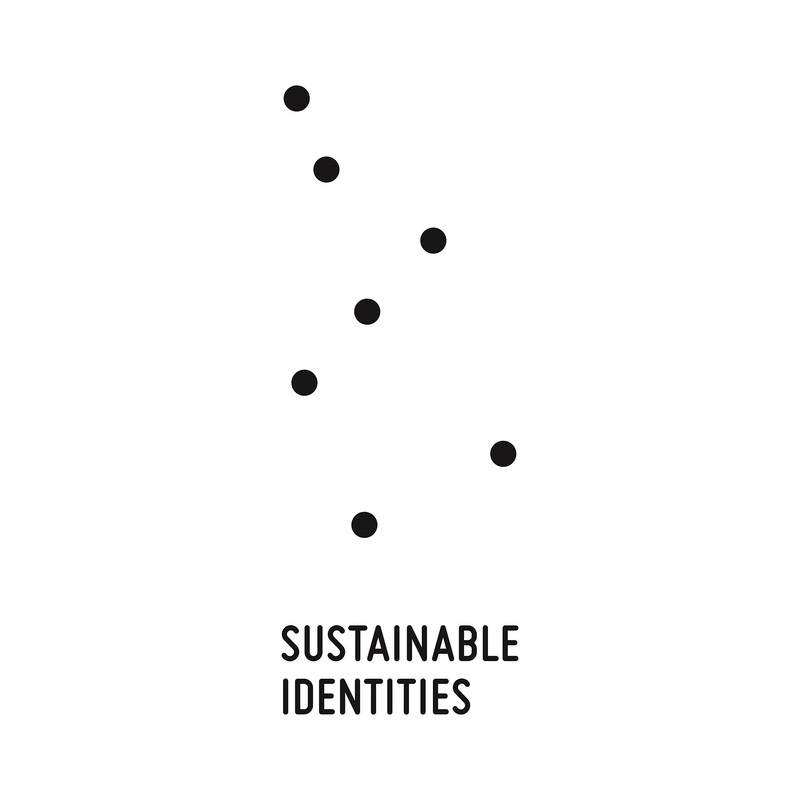 To create new messages related to identity formations and sustainability. 9 MAy-24 November 2015. La Biennale di Venezia, Hungarian Pavilion, Giardini Venice. 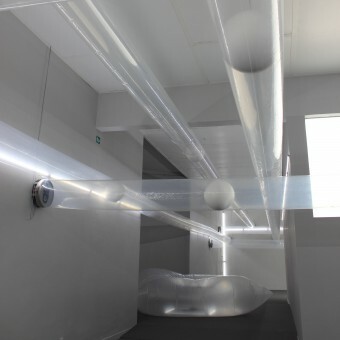 Installation/Art works: electric fans, foil, plexi glass, LED tubes. 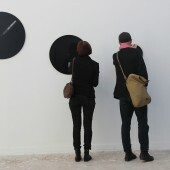 Elements of the inner courtyard: Blackboards, white chalk balls and seven black circles with terms. 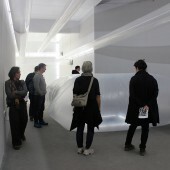 various dimensions, 27 m-4 m.
The realisation of the project started in January 2015 at the MOME-Budapest and the site specific installation was exhibited every seven months in Vencie. The curator and the artist were working closely with design students, university lecturers and the sound artist Ábris Gryllus. The whole preparing process includes real participation. When we were working on the exhibition catalogue, an unrealised plan of Walter Benjamin was at the back of our minds. We realised a bookobject in which invited experts have contributed texts on the subject stemming from their diverse scientific backgrounds. Visitors were very satisfied to have a particiapatory place (inner courtyard), chalk-balls to write and draw and an application which has made abstract 3D voice-objects. The time for the preparation of the exhibiton catalogue and the exhibition was very short. Kinga German- exhibition curator , Szilárd Cseke- all artworks , Mihály Lukács- Art video, Ábris Gryllus-Sound Installation , Tamás Fogarasy- Catalogue Design, Eliza Mikus, Zoltán Fehér and POSSIBLE- Web application , Szilárd Cseke, Attila Cosovan, Tamás Fogarasy- Architecture Design, Szilárd Cseke, Dénes Sátor, Benedek Gulyás, , Hajnalka Illés, Gita Elek, András Fakó, Eliza Mikus, , Brigitta Nachtmann, Zoltán Fehér, Márton Budai, , Boglárka Mázsi and Kinga German- Modelling Conception, and Inner Courtyard and art education objects. All images are made by Kinga German, Szilárd Cseke and Mihály Lukács. Copyrights belong to the artists, to the curator and the Ludwig Museum of Contemporary Art Budapest. Location: The Hungarian Pavilion, created 1909 by Géza Maróti (1875-1941), after World WarII. was severaly damaged and closed down for restoration. Partially reconstructed by Ágost Benkhard (1882-1961), the Hungarian Pavilion was reopened to the public in 1958. In 2015 the pavilion was the home of the project "Sustainable Identities" (Szilárd Cseke-Kinga German). Project performer: Artist Szilárd Cseke having finished his Master's degree in painting, Cseke graduated from the University of Pécs in 1995. He began to create mobile objects in the mid-90s. His works demonstrate social and economic processes, with particular emphasis on themes of migration and the search for identity. Project leader: Kinga German, curator. She is an art historian who has studied at the universities of Heidelberg and Karlsruhe. Living in Germany for 14 years, she was a contributing editor in one of the daily bulletins, where she wrote critiques about contemporary art. In 2011, she received her PhD from Stuttgart University and completed her studies in cultural management at Fernuniversität Hagen. Since 2008, she has been working at the Moholy-Nagy University of Art and Design Budapest, and as of 2015 as an associate professor. Sustainable Identities Site Specific Space Installation by Kinga German and Szilárd Cseke is a Nominee in Arts, Crafts and Ready-Made Design Category. · Click here to register today inorder to be able to view the profile and other works by Kinga German and Szilárd Cseke when results are announced. Sustainable Identities Site Specific Space Installation by Kinga German and Szilárd Cseke is Winner in Arts, Crafts and Ready-Made Design Category, 2015 - 2016. · Read the interview with designer Kinga German and Szilárd Cseke for design Sustainable Identities here. · Press Members: Login or Register to request an exclusive interview with Kinga German and Szilárd Cseke. · Click here to register inorder to view the profile and other works by Kinga German and Szilárd Cseke. Did you like Kinga German and Szilárd Cseke's Art Design? Did you like Sustainable Identities Site Specific Space Installation? Help us create a global awareness for good art design worldwide. Show your support for Kinga German and Szilárd Cseke, the creator of great art design by gifting them a nomination ticket so that we could promote more of their great art designs.